What will happen if a bunch of lawyers gets down to perform a neurosurgery? They will definitely mess up with the patient’s body. It would be very likely the patient might die even. If you look at the Sabarimala’s issue dispassionately, exactly the same thing has happened. The judiciary has hurt the “sentimental nervous system”of Ayyappa devotees. I daresay, the “non-spiritual” lawyers hardly know about the “DNA of faith” and its significance in the pursuit of GOD. Faith, in fact, is a far “subtler” subject which can’t be touched, felt and analyzed with the hammer and tongs of court’s jurisprudence. The justification of rationality without the feeling of sympathy and compassion does not at all heal the wounded belief system. Therefore, the customary practices of “any faiths” that have been handed down for centuries, would be better if they are not crushed down by the gross weight of laws and acts. What is most disgusting is that some of the non-Hindus (non-devotees) and atheists are now pouring oil into the fire of controversy. 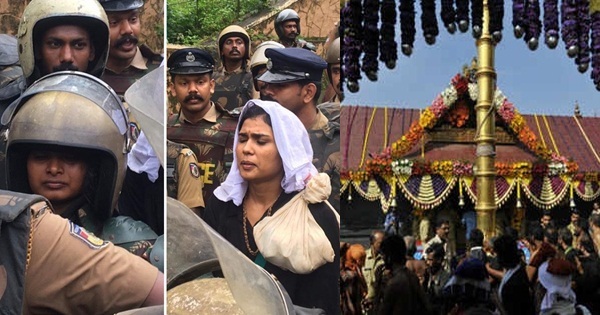 Why people from other faiths have to rush to visit the sacred Ayyappa temple? Are they sincere devotees of Ayyappa? Their facebook posts/blogs and activities clearly reveal what they are up to. Maligning the particular FAITH is their prime motive. Desecrating the sacred seat of Ayyappa has become their new-found adventure. Tripti Desai and her disposition towards Hinduism need no introduction. Who is Rehana Fathima? Is she Hindu? Since when has she become a devotee of Lord Ayyappa? Why is the government not taking the right step when the sacred Ayyappa is being impurified? One wonders how the judiciary utterly fails to suspect such “godless activities” leading to a series of outrageous backlashes for so many years. One can see this as a solid testimony to the “failings” of our judges who can’t see beyond certain horizons. Spirituality is seemingly non-existent to them. Is it not funny that this Sabarimala’s case was moved by non-devotee of the temple — Naushad Ahmed Khan and supported by a group of non-believers et al? If Naushad is so clear-headed and wants to do worthwhile for the society, why is he not campaigning aggressively first against the blatant women discrimination and numerous misinterpretations in the faith he has taken birth in? After having studied a few ancient books sincerely, one becomes pretty convinced that labeling Hinduism as discriminatory to women is like an ill-bred son calling his loving mother a hateful taskmaster who doesn’t allow the son to “touch food” with hands which have not been washed properly after the “latrine”. To know Hindu culture well one needs to make earnest efforts and undertake spiritual practices. But the first thing is that seekers have to “unlearn” all that “misinformation” that has been read and got assimilated into their thought process. Finally, those who want to criticize India being intolerant, I would like to quote a world-renowned science-fiction novelist – HG Wells – “In Indian ancient wisdom, tolerance is not simply a matter of policy but an article of faith”. However, it is very ungodly to “tolerate” the rise of sinister voices that senselessly spread misinformation and brutally hurt Hindus, nay humanity. Featured image courtesy: indiatvnews.com and Times of India.